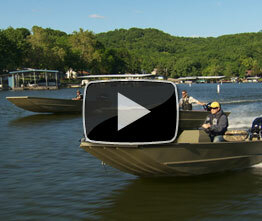 Lenny Rudow takes a detailed look at design changes to Lowe's already successful jon boat. 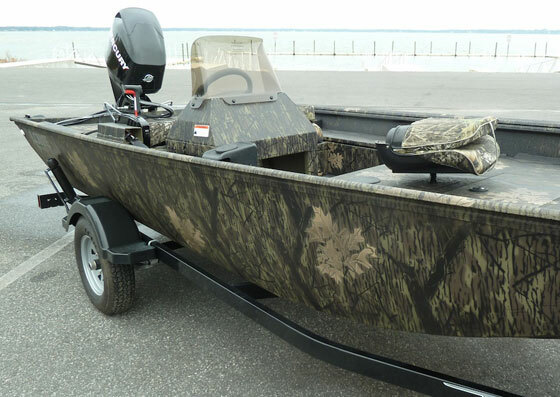 If there’s any one boat design that’s an all-American boat, it’s the jon boat. 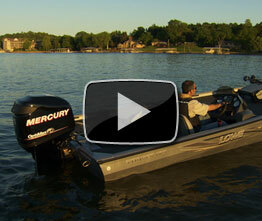 The jon boat is incredibly simple, incredibly versatile. It’s incredibly inexpensive. It’s easy to trailer. It’s easy to handle. You can use ‘em for fishing, crabbing, clamming, hunting. 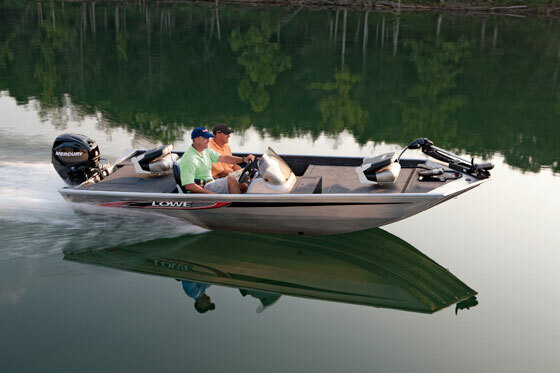 Whatever you’d like to do, the jon boat can handle it. 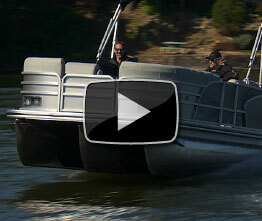 Lowe has a new series of jon boats; they’re called the Frontiers. 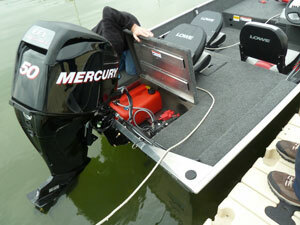 Now we spent a couple of days here in the Lake of the Ozarks testing out these Frontiers to see if they make the grade. Boy I like that foredeck. My jon boat doesn’t have a foredeck like that. Clint: That’s right. And all the Frontiers from 15-20 feet offer this, as well as an optional pedestal assembly. Nice! And I’m guessing there’s foam under there, so this boat can’t possibly sink? Clint: Absolutely. Under the front deck, in the floor, and also at the rear transom area. I like the tiller steer but some guys don’t. What else can they opt for? Clint: Sure. The first series comes in a 15, 16, 17, 18, and 20 foot version, and you can put an optional side console in any of those lengths. In my jon boat, my lights are always rolling around, so I finally went and got a mount. And you know what happened the first time after I mounted it there? Whoops! I broke the mount. But I love how you guys have put these tough rubberized mounts there, so they don’t break. So here we are on the Frontier 17. One of the things to note about this boat is that the ribs are on 10 inch centers. That really gives it a lot of strength, doesn’t it? Clint: Absolutely. You see all eight of them right there in the cockpit area. And this is a plywood deck, right? Clint: No! All metal. There’s no plywood anywhere in this boat. Excellent, excellent. One of the things I really love about this deck is that it’s turned down at the sides. I can take my pen—ah, look at that! Did it roll under the deck? Nope, I can still get to it. 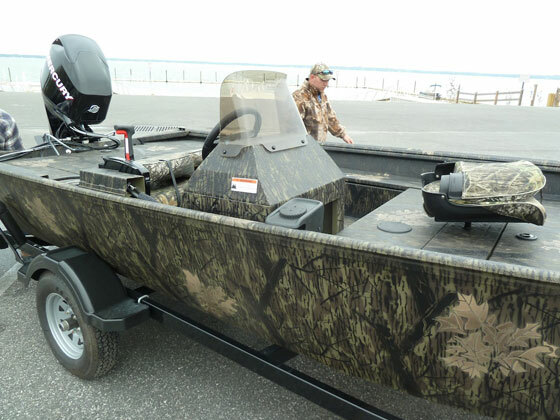 As anyone who’s ever been duckhunting in a jon boat knows, under the deck is where your shotgun shells end up half the time. If we start from a dead stop, this boat really gets over the hump with no problem. A lot of guys don’t necessarily like the tiller steering system, but you know what I love about it? It’s so maneuverable. You just twitch your arm, and that boat goes exactly where you want it to. Clint: It is nice, yeah. 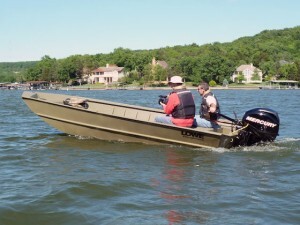 Now we were running this boat with a GPS yesterday and we came real close to hitting 30 mph. And we have a 40 horse on here of course; is that the maximum for this boat? Clint: Yes it is, for this particular tiller unit. And we have a real nice mellow 20-22 mph cruise right here. All right… it’s not a 36 foot cabin cruiser. These boats are not going to impress your family and your neighbors. But you know what? No matter how you spend your time on the water, there’s a good chance there’s a boat in the Frontier line up that’s right for you. Me? I love this 17 footer. It’s a perfect combination of size, economy, price… what’d you say these cost?